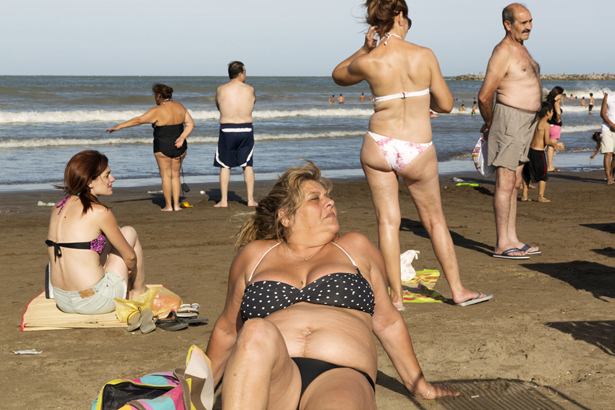 I first came to Mar del Plata, the largest Argentine seaside resort, way back in 2007 when I was shooting images for my Playas project, a survey of Latin American beaches. I was amazed then at the scale of the resort. It has two thousand hotels, sixteen kilometres of beaches, and welcomes over seven million visitors a year. In terms of scale, Mar del Plata dwarfs other well known resorts across the globe, including Copacabana, Blackpool and Benidorm, yet it is virtually unknown beyond Argentina. Keen to return and explore further with my camera, here I am, many years later, in the first week of January, the busiest week of the Argentine summer season. The central beach is called Bristol and I take great pride in telling people that I actually live in the original Bristol. Quite how it was named Bristol is beyond me, but it is quite something to behold. The beach has its own rhythm. Early in the day, starting around 8 to 9am, the regular and generally older beach goers arrive to sunbathe, swim and meet old friends: people return to the same spot year in, year out. You will never see a better collection of sun hats, one-piece costumes and beach umbrellas in one location. Slowly but surely the beach fills, as the sunshine intensifies and the heat builds up. By the time the young families arrive in the early afternoon, it can be a struggle to find somewhere to sit. A vast assortment of foods and knick knacks are available to purchase, there is a constant chorus of goods being announced to the beachgoers. African vendors wander the beach selling watches and sunglasses. Churros, pop corn, all manner of Argentine snacks are there for the taking. Bristol is the traditional beach of Mar del Plata. The visitors hail from the interior of Argentina as well as from Buenos Aires, so you see some real characters. Driving here on the main road from the capital you see hundreds of buses making their way to Mar del Plata from all over Argentina. Mar del Plata caters for all classes. The wealthier, more middle class visitors congregate on beaches such as Playa Grande, avoiding Bristol like the plague. If you are really wealthy you go to Punta del Este in Uruguay. On Playa Grande, you will see a young set on the left, and older visitors, together with families on the right. You will also see the residents of the city come out here, as it is their local beach, with the many high apartments for retirees lying behind. So each of the twelve or so beaches has its own cast, defined by class and position, with its own regulars. In the end for me, all paths led back to Bristol beach, where the assembly of characters was the most distinctive. Another challenge I set for myself was that for the first time I took a telephoto lens to explore what was possible. This new venture threw me out of my comfort zone – a challenge and a bit unnerving. From a high vantage point you can isolate people, and zoom into the crowds. You can focus and pick up detail the human eye would struggle to identify. I will continue this exploration when I resume my UK beach season this summer. This work has its own language and momentum, and I am just feeling my way around the new possibilities. On my way back to Buenos Aires I stopped by to visit Ataulfo Perez Aznar who has photographed in Mar del Plata for many years and is best known for his medium format, black and white portraits that he started shooting in the 1980s. Just down the road from his home in La Plata is the river resort of Punta Lara and we went there together to catch the fading sunshine and the Sunday crowds. Although it is in effect an estuary there were big numbers of picnickers and the place had a similar feel to Bristol beach. Many of the crowd came from the shantytowns around Buenos Aires. Along with photographing tourists, going to beaches has been a life long fascination for me, and I have travelled to five continents in my search for the best beaches for people and atmosphere. There is no question in my mind that Mar del Plata is number one of all the beach resorts I have visited. It is the resort with the most energy, the best crowds and has not been sanitised or lost its enduring popularity. If you are Argentinian, visiting Mar del Plata is like going to school; it has to be done, there is no choice.